See Sherlock Holmes live again as Sir Arthur Conan Doyle’s A Scandal in Bohemia comes alive in a libretto by Professor of English Literature Nathalie Anderson set to music by Associate Professor of Music Tom Whitman ’82. Preceding the performance, there will be a special alumni reception with an overview of the opera given by Professors Anderson and Whitman. Keynote speaker Richard Teerlink, former chairman and chief executive officer of Harley-Davidson Inc. will highlight the 10th Lax Conference on Entrepreneurship. Teerlink led Harley-Davidson’s fabled turnaround, creating an open, participatory culture of trust conducive to employees giving of their best. In these difficult times, he challenges entrepreneurial leaders to become engaged and reinvent their own organizations. The conference features alumni entrepreneurs and business leaders and offers alumni and students the opportunity to interact with and learn from them and from each other. As the governing body of the Alumni Association, the Swarthmore Alumni Council participates in a range of activities that support students, alumni, and the College. This spring, the current council is inviting all former members to join them for an Alumni Council Reunion. Special activities have been planned for returning former members. Three days of the most fun ever. Will you be here with your classmates? For more information, visit alumniweekend.swarthmore.edu. Mark your calendars now for this summer’s Alumni College: “Hope and Courage.” You are invited to campus for four days of intellectual challenge, lively discussion, and entertaining experiences—and no tests! Our faculty members are putting together an exciting program, which will be unveiled later this spring. 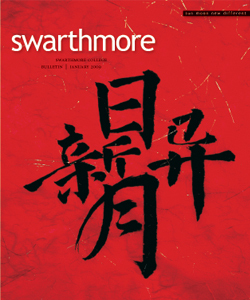 Watch your mail, e-mail, and the April Swarthmore College Bulletin for more details. For the latest on events near you, go to swarthmore.edu/alumni_events.xml.